Amy Goldstein. Janesville: An American Story. Janesville, Wisconsin, population 63,000 was the home of the oldest working GM plant. For eight and a half decades, the plant had operated “like a mythy wizard, order[ing] the city’s rhythms.” But two days before Christmas of 2008, the corporation closed down the plant, due in part to nation’s financial crisis. Journalist Amy Goldstein examines the lives of several individuals and families who suffered as a result of catastrophe thrust upon them. Janesville had been the home of a large, prosperous working class. But as she follows these people for five years from the shutdown, Goldstein demonstrates how difficult it can be to recreate that prosperity. She reveals the economic and sociological chain reactions triggered by the plant’s closure. Companies that provided parts for GM also closed, e.g., Lear Corporation that built auto interiors and seats. Non-profit organizations lost board members and key contributors. Charitable organizations began to fade away. The very fabric of families began to unravel. The citizens of Janesville, known for their can-do spirit, “set out to reinvent themselves” by finding other work, or seeking re-education. Blackhawk Technical College was a logical location for out-of-work people to seek new expertise. Sadly, many new students dropped out quickly, often because they had no computer skills or study habits. Many quit when they learned that there were no job openings in their “new field.” Others found that they had no aptitude for the new work. Those who did receive their diplomas or certificates found that they were earning one-third less than they had at GM, whereas those who had taken other jobs without retraining had earned 8% less than at GM. By the end of her study, Goldstein found that Janesville had split in two: the very well-off and the economically struggling. With the basic destruction of the working middle class, the gap between the haves and the have-nots had become a gulf. The majority of people surveyed in 2015 testified that the economy had not recovered—and that six in ten believed that Janesville would never be a place where workers felt secure. Goldstein illustrates the effects of the shutdown by tracing two dozen individuals whose lives had changed drastically. The Wopats were a family split apart. The husband, Matt, had worked at the assembly plant for 13 years; he accepted a transfer to Fort Wayne where he could maintain his good salary ($28/hr). Fort Wayne is nearly 300 miles from Janesville; so he then became a “Janesville gypsy,” traveling home on weekends. Travel and rental expenses dug into his income, but he fared better financially than most of his former colleagues. But his entire family felt the separation greatly. Kristi Breyer and Barbara Vaughan lost their jobs when Lear Corp. closed. Both sought to reinvent themselves by enrolling in the Criminal Justice training program at nearby Blackhawk Technical College. After both graduated with honors, they were employed by the county jail corrections office. But Barbara hated the work, preferring to assist people before they were in trouble. Out of work by 2011, she enrolled in a university to earn credentials as a social worker. She succeeded, but wound up earning $10.30/hr., about 40% less than she made at the jail, and less than 50% of what she had earned at Lear. Her consolation was that she was helping developmentally disabled adults become as independent as possible. Unfortunately, Kristi’s reinvention became catastrophic. She and her husband were effectively separated by conflicting work schedules; she was then suspended for having an affair with an inmate; she eventually committed suicide. The Whiteakers exemplify the struggle of middle-class families, devastated by both the plant’s closing and the recession. Jerad, the father, refused to become a “gypsy” and was forced to take low-paying jobs without health insurance—and these jobs made him miserable. He was finally contented with delivering auto parts at $12/hr., but he was financially strapped. His wife, Tammy, worked part-time entering data for Home Entry Services. In the past, she had been a dedicated worker for “Bags of Hope,” a charity which delivered free groceries to needy families. After the shutdown, she found herself on the receiving end of the charity. Their twin daughters, Alyson and Kayzia, heroically helped their parents meet ends. Both worked several jobs, and occasionally, took their mother grocery shopping (paying for the food themselves). They also gave their younger brother money so that he would not miss school activities. Ironically, their earnings put the family above the arbitrary poverty line so that they could not receive help from the local food pantry. But the girls thrived as they headed off to college, having earned excellent grades—and more importantly, they had become mature, responsible young adults. Three dedicated citizens worked together to reduce the crushing aftereffects of the plant closure. Bob Borremans ran the Rock County Job Center, through which he initially tried to “cushion the blow” of job loss as soon as he heard of GM’s plans. 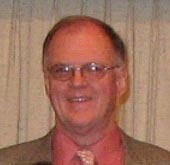 He created a guide to all job resources in Janesville. He helped organize the collaborative efforts of several institutions, including the University of Michigan, and helped to arrange for financial assistance for those who might attend Blackhawk Tech. He sought help from the federal Department of Labor, but felt short-changed when the government seemed to fall away from its commitment. Politicians living in the area appeared to do little more than give lip-service support. Deri Wahlert, a high school social studies teacher, created a high school “supply closet” to provide food, clothing and health essentials for young people from needy families. By 2013, the end of Goldstein’s study, 200 students were using the closet. Deri was devastated by the stress that these students suffered; some even contemplated suicide. Ann Forbeck, a social worker, was the liaison for homeless students in the Janesville School District. She founded “Project 16:49,”the number representing the hours and minutes that between the end of school and the start of the next school day. Those were the hours when many would be without a place to stay. She initiated a drive to build and maintain emergency shelters, but found that charity support was diminishing. The situation was desperate in 2013 as 968 students didn’t have a “fixed place” to sleep at night. One hundred seventy of these students were on their own. 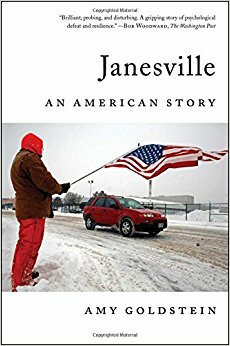 Janesville’s story is primarily that of the shrinking blue-collar middle class. The cumulative traumas of abrupt termination led to frustrating attempts at re-education and re-training, drastic reduction in available living wages leading to mortgage foreclosures, malnourishment, and family separations. The “can-do” attitude of the proud families was generally rewarded with obstacle after obstacle, resulting in most cases in a willingness to settle with what was obtainable. The heroic efforts of some of the individuals that Goldstein high-lighted are certainly noteworthy, but the overall picture is grim.